Knockback Jinx is the very first Jinx you will learn in Harry Potter: Hogwarts Mystery year one chapter seven from Professor Flitwick. This will be a great addition to your dueling spells. Jinx is a very powerful type of spell that can, on some occasions, be very dangerous. At first, they seem harmless but Jinxes belong to spell class called the Dark Arts. This is the real deal. Dark Arts are the types of spells that will 100% harm your target, and on some occasions they will hurt the caster as well, depending on what spell is being cast. 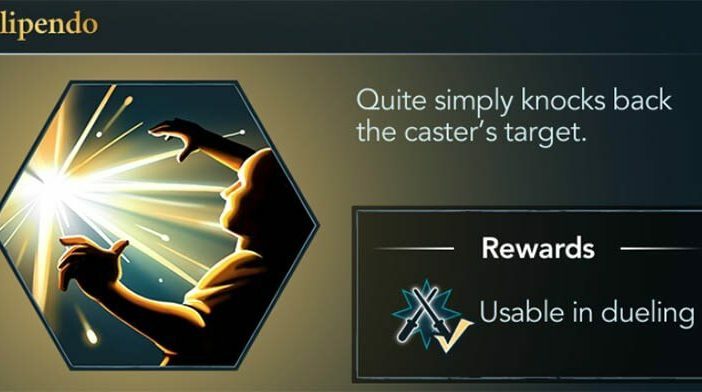 As for the dangerous part of Knockback Jinx, it can do a reverse effect on the caster if he channels the power in his wand too much, and upon releasing it will backfire, knocking the caster down and potentially hurting him! Knockback Jinx is also called Flipendo. As the part of the name says, upon casting it will literally flip your target or push everything in your path. Let's get into details. Flipendo can be used for more than just dueling. Besides physically repelling your opponents, you can also knock objects away and even activate hidden magical switches. Flipendo may sound ridiculous but in the hands of a master spellcaster, it can do a lot of damage. You would have to focus hard and charge every bit of power you have in your wand and release it at the right moment. If you overdo it, it will backfire and that could end up badly, hurting the caster and knocking him to the ground. It will be hard for you to learn this important dueling spell in the beginning, because you've made a mess earlier and broke one of the Hogwarts school rules. Professor won't go easy on you and allow you to learn another strong dueling spell. But eventually using the right words with Professor Flitwick, he will agree that it's the best for you and your safety to learn this spell from him. In order to cast your first Jinx, you will need to study and learn every little bit of Flipendo. It's the first spell that can deal a significant amount of damage, so you must know everything about it in order to cast it correctly without damaging yourself. The learning process will consume a lot of your energy. Taking notes, listening to the professor, practicing your stance etc. Once you have completed every single task you are given, you will be ready to try and cast your first Knockback Jinx. If you've flicked your wand in the right direction and shape you will cast Flipendo and the dummy you are targeting will be knocked away.